One of the most exciting birds of late is the Pine Grosbeak, Pinicola enucleator, discovered by Matt Anderson back on November 21. 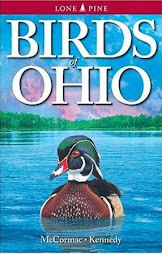 The bird has been frequenting an area next to the Oak Openings Metropark in Lucas County, not far from Toledo. Displaying amazing site fidelity the likes of which we've not seen here before with this species - at least in modern times - it is still being found in this area. 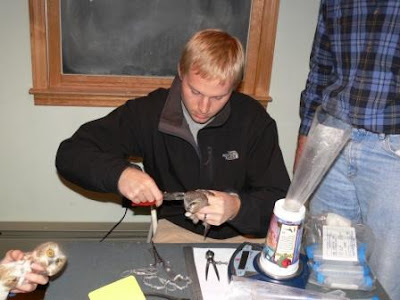 Many an Ohio birder has gotten their state or even life Pine Grosbeak because of Matt's find. And an amazing bit of birding skill it was to find this jumbo finch. 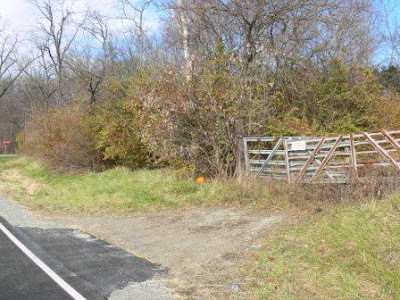 The area in which it occurs is not exactly eye-catching, nor a spot that most birders would probably spend much time in. I was fortunate enough to see the bird myself last Sunday. Shortly after arriving at the spot and joining several other birders in the stakeout, I heard the grosbeak calling not far off. A minute later it shot right over our heads and landed near the top of a tall Hackberry tree, offering us stellar views. It appears to be a young male, not yet in the full pinkish-raspberry hue of an adult. This is the spot. A weedy semi-wooded edge choked with non-native plants. All that green understory is Amur Honeysuckle, Lonicera maackii, a Eurasian invader that is now prolific in many regions of Ohio. This bush fruits prolifically and the shrubs are decked with red berries. That's apparently what the grosbeak is gorging itself on. Pine Grosbeaks are largely frugivorous (fruit-eating), and it won't run out of fodder here for some time. The issue is the poor nutrient content of honeysuckle fruit. Like vegetative M & M's, they look great and probably are tasty to birds, but are deficient in lipids and proteins. It's likely that a diet of such fruit lacks the necessary substances to sustain birds well when the winter weather gets tough. Here's our guy. Large and confiding, Pine Grosbeaks are known for their docility and often can be closely approached. The typical modus operandi for this bird is to fly in from the south, and alight in the top of this small Hackberry tree just to the east of the gate in the above photo. There he sits, surveying his kingdom for a few minutes while the assembled throngs of birders ooh and aah over him. Then, like a meteor falling from the sky, he dives straight down into the thickets, presumably to engorge itself on berries. You've got to be there at just the right time; a number of birders have either missed it altogether - as I did my first visit - or have had to wait hours before King Finch made an appearance. Pine Grosbeaks are northerners, birds of the vast boreal forest. They rarely stage irruptions southward in any great numbers, and only very rarely venture as far south as Ohio. The largest Ohio invasion ever was during the winter of 1961-62. That winter, flcoks or individuals were seen in a number of laocales, including an incredible flock of 100 near Akron. At least one bird made it all the way to Cincinnati. Interestingly, that year they began to show up in November, right around the same time this bird did. The record is not quite clear as to the last confirmed Ohio sighting prior to this one; either 1987 or the perhaps the early 1990's. In any event, this Pine Grosbeak was a spectacular find and has thrilled many of us. Wow, an extraordinary number of unusual birds have been appearing of late, stimulating rarity fever amongst the masses. Matt Anderson's fantastic discovery of a Pine Grosbeak leads the list in terms of sensationalism - the last dates from 1987. This beak is nearly everyone's state Pine Grosbeak, of those who have been lucky enough to see it. I was one, and have some photos that I'll blog later. 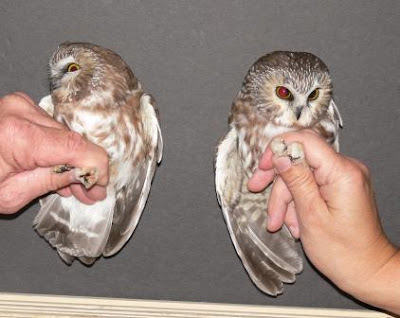 I also just received word of a very interesting Northern Saw-whet Owl that was captured at the Chillicothe banding station already sporting a band. This one has come a LONG way, and I'll get those details up here soon. But, the showiest of all is an amazingly cooperative Sabine's Gull found at Huron on Turkey Day, November 22, by Mike Busam. Congrats to Mike for locating this bird and tipping everyone off. Because he did so, a great many folks have seen this beautiful small gull for the first time. 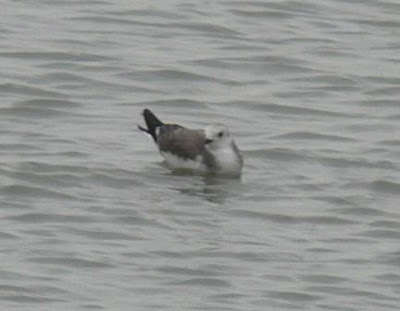 Sabine's Gull is quite rare in Ohio, with only a few seen each fall, if that. Most don't stick like the Huron bird, either. These arctic breeders are highly migratory, wintering primarily in tropical seas off Africa and South America. Relatively few pass through the Great Lakes. 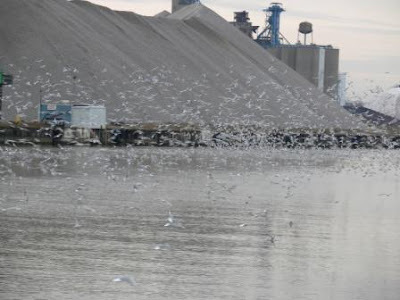 Upon arrival in downtown Huron and the river, one is greeted by mobs of Bonaparte's Gulls, making a cacophony of noisy squeaking buzzes. Masses of Bonies are always great places to look for rare gulls. Indeed, this horde contained at least two Little Gulls, according to other reports. Adult Bonaparte's in flight. 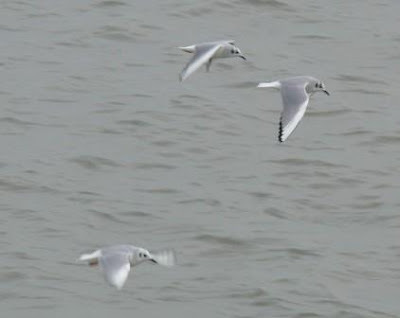 These small gulls are quite striking with their flashing white leading edge to the upper wing, and bouyantly graceful flight. They are not the trash-eating McDonald's scavengers that some of their larger brethren are; Bonies are highly piscivorous, deftly picking small fish like Emerald Shiners from the water. Adult Bonaparte's Gull at rest. A strikingly beautiful bird, even without the black hood they sport in breeding plumage. The best is yet to come, though. Ground zero at Huron, the terminal point of the municipal pier. 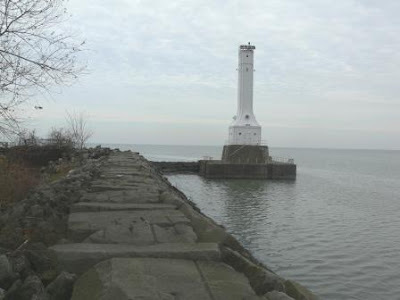 The lighthouse is a great place to watch birds moving past on the lake. I've spent countless hours out there, many of them in November. Conditions are often not very pleasant, with blustery winds and freezing temps. Such was not the case today, with hardly any wind and low 40's. Quite balmy for a late November Lake Erie day! This is the spot that the Sabine's Gull is fixated on, and it made frequent flights right around the lighthouse, sometimes flying within ten feet of us, or roosting on the water nearby. Sabine's Gull, Xema sabini, at rest. Doesn't stand out nearly as much as when in flight, as you'll soon see. About the size of a Bonaparte's Gull, the brown mantle of the Sabine's is distinctive, as are those blotches of brown that extend forward onto either side of the breast. This may be the only gull named for an astronomer. Sir Edward Sabine was an astronomer who accompanied an 1818 expedtion into the Arctic, and helped discover the gull. His brother, Joseph, named it in his honor. 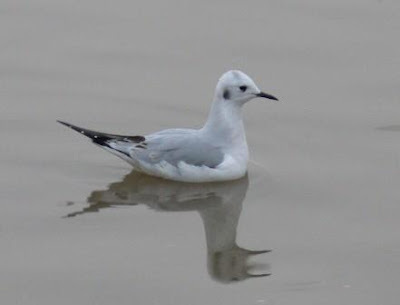 I was fortunate in running into my friend Brian Zwiebel upon arrival at Huron, and we were able to spend the afternoon birding and admiring the Sabine's Gull. Brian is a topnotch professional shooter, as you can see from the above photo, which is his. Although often close at hand, getting crisp in-flight shots of the bird was not easy. As befits such a long-distance migrant, the gull is quite effortless on the wing, and deceptively fast. The upper wing pattern is unmistakable and stands out from great distances. The slightly forked tail is also characteristic and adds yet another interesting touch to an already visually stunning bird. If you haven't made the pilgrimage to see this Sabine's, I'd go while the getting is good. Thanks to Mike Busam for finding this bird and communicating it to all, and to Brian for graciously letting me use his photo. Cassia's Owl-Butterfly, Opsiphanes cassiae. Not the species named for Mrs. Kitzmiller - read AP story below - but presumably somewhat similar. GAINESVILLE, Fla. — A butterfly species discovered in a Florida museum has a new name after an anonymous bidder paid $40,800 for naming rights in order to honor a woman who died in 1972. The butterfly's common name will be the Minerva owl butterfly. It's being named after the late Margery Minerva Blythe Kitzmiller of Malvern, Ohio. While the bidder's name was not disclosed, the payment was made on behalf of Kitzmiller's grandchildren. The butterfly's scientific name will be Opsiphanes blythekitzmillerae. University of Florida researchers George Austin and Andrew Warren discovered the new species while looking through a butterfly collection at the Florida Museum of Natural History in Gainesville earlier this year. They found it was misidentified as an example of another species. 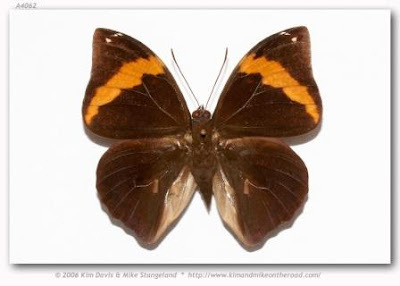 The 4-inch butterfly is brown, white and black and lives in Sonora, a Mexican state bordering Arizona. 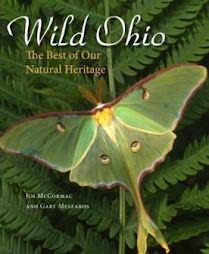 Proceeds from the auction will go toward further research of Mexican butterflies. Beverly Sensbach, director of development for the museum, said Kitzmiller's grandchildren wanted to honor her through the name of a beautiful butterfly because she was "an extremely creative person who wrote poetry, played piano and sang." The rights were sold via an online auction. Warren had said before the auction closed that the researchers were hoping to raise at least $50,000, which would fund two years of work in Mexico. One of the most abundant birds in Ohio and much of North America is the Mourning Dove, Zenaida macroura. Hardly a soul over here would walk two steps out of their way to admire one. Not across the pond, though - read the following BBC blurb kindly sent along by Kathy Mock. DEFINITION: "Twitchers" is Brit-speak for rabid listers. 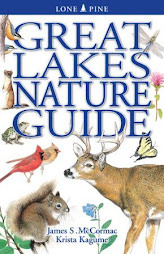 You know, the type that would appear at Conneaut Harbor within two hours should a rarity like Horned Puffin appear there. A dove spotted only a handful of times in the British Isles has drawn dozens of bird watchers to North Uist. The American mourning dove was first seen by Brian Rabbitts about three miles (4km) from where he previously saw one in 1999. Wildlife guide Stephen Duffield said more than 100 twitchers had flocked to the Western Isles to see the bird. The British Birds Rarities Committee said it was aware of the sighting and was awaiting a recording. I was able to spend some time in a remote, off-the-beaten path glen in the Hocking Hills today, and it was well worth the hike. Many of the trees still retained splendid colors, and mosses and lichens are at their crusty best at this season. Following are a few of the few hundred photos that I snapped. Sandstone outcrops define this site. A rocky mesa juts above the surrounding valleys, and the core rocks are fractured into crazy slump blocks. In places, it is like a rocky maze of narrow tunnels, each filled with a bed of newly fallen leaves. The leaves still impressed. The orange-red mist is the foliage of Sourwood, Oxydendrum arboreum, our only tree in the heath family. It grows in the poor soils of rocky ridges, such as this one. The pale yellow leaves are those of Chestnut Oaks, Quercus prinus. It is another tree of acid ridgetop soils, and festoons sites like this in abundance. That big, left-listing trunk is a Chestnut Oak. This photo really demonstrates the rocky nature of the ground they spring from. Soil on sites such as this is thin, and poor. A Chestnut Oak of this size will have taken lots of years to reach such girth. The bluish-green circular patches on the rocks are a type of lichen, Flavoparmelia baltimorensis. Lichens begin the long, long process of breaking down sandstone rock. A Sourwood leaf adds an electric burst of flame to the somber tones of the bark of a Chestnut Oak. This old tree is garbed in thick coats of lichens, of several species. I believe these grayish foliose lichens are in the genus Hypotrachnya. Lichens are the products of commensal relationships between algae and fungus, collectively forming the organism we see above. They are hyper-sensitive to air pollution and are amongst the first organisms to vanish if air quality suffers. North meets south in this special place. The rocky grotto in the backdrop is choked with a river of Great Rhododendron, Rhododendron maximum, in such profuse tangles that one might be excused for listening for Swainson's Warblers. This is nearly the northernmost outpost for this Appalachian heath. Overshadowing it are plenty of Eastern Hemlock trees (Tsuga canadensis), a northern tree nearing its southern limits here. The stunted, twisted trunk of a Mountain-laurel, Kalmia latifolia. This smaller relative of the Great Rhododendron also has thick, fleshy evergreen leaves and is still bright. The gnarled trunks resemble wild bonsai, especially this one, as it springs from a lush bed of pincushion moss (genus Leucobryum). The last wild flowers of the year - Witch-hazel, Hamamelis virginiana, right on schedule. November is the time to look for the spindly pale yellow blooms dangling from the barren branches of these small, multi-trunked woodland shrubs. It's easy to miss them, and easy to wonder how you missed them once you see them. I made a trip back down to Chillicothe last night, to re-visit the banding station that is focusing on capturing and banding Northern Saw-whet Owls. Thanks, as always, to Kelly Williams-Sieg, Bill and Donna Bosstic, and Bob Placier for being so gracious about hosting guests. With endless amounts of patience, they allow us hangers-on to ogle the tiny hooters, and ask all manner of questions. These small owls of the North have proven to be outstanding avian ambassadors, undoubtedly being the "spark" to who knows how many folks to get them interested in birds. But, the data that is being generated by the efforts of this group and many other banding stations that are part of Project Owlnet is also offering previously unknown insights into a secretive species that we hadn't known very much about. And man, I was glad some owls turned up last night! We had a rather celeb cast on hand, partly on my invite, and we would have felt bad if no owls showed. They did, fortunately, with three birds being caught. One had been banded the previous night; the other two were new birds. This brings the total capture since October 10th - 28 nights of banding - to 93 different birds! That's over three an evening, on average. This is definitely the year os the saw-whet. As always, the owls were over the top in terms of being photogenic. Megan Nadolski, a professional photographer who was along to photodocument the owls and the operation for an upcoming magazine article, took over 800 photos! Many of them were stunners, too. I bumbled along with my less than mad skillz and - by comparison to Megan's - rinky-dink camera, and captured a few images to share with you below. We are going to take people over to see this operation - and with luck, real owls - the evening of the upcoming Conservation Conference on December 1st. We'd welcome your attendance at that event, and go here for all of the details. Weather depending, we'll head over to see the owls after Scott Weidensaul's talk that evening. The owl site is less than one-half hour from the Deer Creek Lodge, the conference venue. Northern Saw-whet Owl. An almost shockingly "cute" animal. Inestimable numbers of "oohs and aahs" have been provoked by these elfin beasts. This is the last view that a Deer or White-footed Mouse would have of this world, were it to glance over its shoulder in time. As cute as these owls may be, they are nonetheless complete predators fully equipped to take out mammalian prey, and they do so with gusto. The two mice mentioned above are small species in the genus Peromyscus, and undoubtedly saw-whets eat many when down our way. In their boreal forest breeding range, the owls likely also feed heavily on Red-backed Voles, Clethrionomys gapperi. This small vole is common throughout much of the saw-whets' breeding range, but was quite rare and local in Ohio, with only old records from the northeastern corner of the state. Measuring an owl's foot. Not for a shoe fitting, but to gather additional data that might help in sexing birds. Sometimes, telling males from females is not that easy and banders are still learning ways to distinguish the sexes. These owls are incredibly tolerant of people, and the banding process. Generally, they just lay there and look at the people with a rather curious attitude. I suspect that for many owls, we are the first humanoids they have ever seen, and that in conjunction with their calm dispositions leads them to view us rather peacefully. Sometimes, upon release an owl will be placed on someone's arm. There it will sit, sometimes for several minutes, before deciding to fly back into the dark forest. 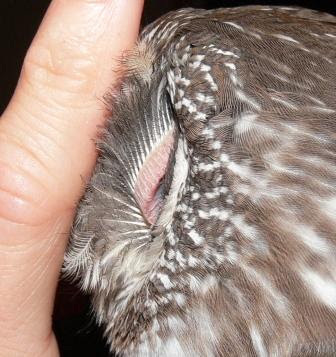 Something rather amazing that we've found is that saw-whets seem to greatly enjoy having their necks rubbed. That's what is going on here, and the owl has hooded its eyes and is pushing back into the fingers of the petter, much in the manner of a cat. I found that when I gently rubbed the sides of their heads, they also relished that feeling and would push hard against my fingers and practically become entranced. No, I don't think the micro-owls suffer much from their banding experience and I'd be surprised if their heart rates even elevate a beat. If you make it down for the Conservation Conference, I hope you'll get to come over and experience these owls firsthand, too. Green-breasted Mango, courtesy of Bill Hilton and Hilton Pond. The Green-breasted Mango, Anthracothorax prevostii, is a spectacular (are any hummingbirds not?) species of Mexico and Central America. In their normal haunts, mangos can be common and don't cause much of a stir. North of the U.S. border, it's a different story. The first United States Green-breasted Mango was found in south Texas in 1988. Since then, records have steadily picked up in the Rio Grande Valley region. To date, there have been but three records elsewhere in the U.S.; North Carolina in 2000, Georgia just this past October, and the subject of this post - a bird that turned up in Beloit, Wisconsin back in September. All have been juvenile males (the bird pictured above is an adult). 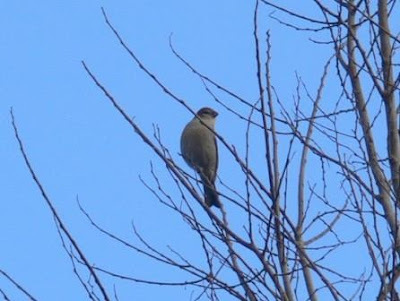 The birding blogosphere has been alive with buzz about the recent capture of the Beloit bird. As it tarried on, frequenting the same feeder where it was found, Wisconsin's famously frosty winter began to set in, as it does every year. This prompted some of the local birders to understandably worry about the fate of the mango. After all, tropical hummingbirds are not well-equipped to withstand the ravages of cold, snow, ice, and sub-freezing temperatures. So, a few days back well-intentioned mango fans captured the bird, and have made a home for it at the Brookfield Zoo near Chicago. The questionable legality of this bit of do-gooderism aside, a few other issues pop to mind. First, should we really meddle with wild birds like this? This Green-breasted Mango reached Wisconsin on its own power, and although it did seem increasingly unlikely that it would flee the onset of winter successfully, one never knows. We get Rufous Hummingbirds annually now in Ohio - as do many other northern states - and they frequently linger into very cold weather. Most then disappear, and in some cases have reappeared again the following year, demonstrating that they were able to bail out on weather that would eventually do them in, and manage to return to more hospitable climes. 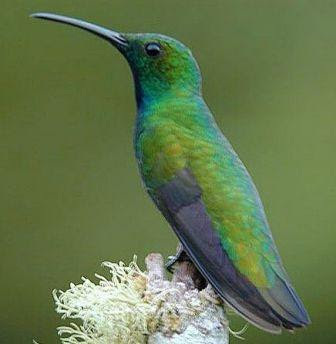 Strong fliers like hummingbirds can cover great distances quite speedily if need be. Good ole Ruby-throated Hummingbirds migrate 500 miles across open waters of the Gulf of Mexico, and probably do so in about 24 hours. Mangos can likely move along at the same clip, which means the Wisconsin bird could be a much warmer bundle of feathers quite soon should it have decided to speed due south, which it may well have eventually. What this mango is doing is part and parcel of evolution, a beautiful process that humans would do well to leave alone. Many species of birds, and flighted insects, send pioneering scouts far beyond their normal range. No, it's not part of a conscious plan of attack by the Green-breasted Mango Central Committee; rather it is just the constant underlying energetic need of a species to expand and conquer. We humans do it, too, most relentlessly of all. With birds, it is often the young males that go far beyond the pale to prospect, searching out possible new empires to colonize. One might think of a species like Green-breasted Mango as an inert bag of popcorn (stay with me). Most of the year, the kernels in the bag just sit there, happily remaining in their range (the bag). However, once a year - fall, typically - the microwave activates and begins jostling the kernels. As they pop, some are flung very far from the core population. Nothing will come of most of these wayward kernels, especially the ones that end up far distances from home, like the Beloit mango. Some of the explorers eventually stick, though - witness mangos going from a first U.S. record in 1988 to becoming regular in south Texas now. Over long periods of time, this is how bird populations expand. Sure, the Wisconsin mango isn't going to start a new breeding colony amongst the cheeseheads, but it is still part of mango evolutionary expansion. We should leave it alone. Hummingbirds, and insects like butterflies and dragonflies, are environmental change hyper-responders. Because of their extreme mobility and ability to benefit from slight temperature changes that cause greater food sources such as nectar and prey insects for longer periods, some species in these groups have become conspicuous northward invaders in recent times. Witness the now common phenomenon of western/southern hummers into the Midwest. Ohio's first non-Ruby-throated Hummingbird was a Rufous Hummingbird in 1985; now we've had dozens of records and three other species have appeared since. As temperatures gradually warm, we will see more and more northward hummers. What if we were to capture all of these extralimital hummingbirds because of foolish and unfounded fears about their well-being? It would be like erecting a Hoover Dam to staunch nature's grand scheme, the continuous ebb and flow of species trying to expand their populations and evolve. Over the eons, in huge time spans that most of us humans don't do well grasping, such wayward vagrancy in fits and spurts led to the evolution of the fantastic phenomenon of waves of migrant warblers, vireos, flycatchers, and other neotropical wanderers. I don't mean to criticize any indivuals for the Wisconsin mango fiasco; after all it is all too common for people to think we know what is best for nature, and to manipulate it. The reasons for the mango capture are well-intentioned; unfortunately the basic understanding of nature and biology that drove this action are lacking. For a good solution to the Beloit mango, go here. For an interesting read from the Milwaukee Journal Sentinel, go here. Spent Saturday over in Indiana; a state renowned for Bobby Knight and Hoosier basketball, the Indianapolis 500, John (Cougar) Mellencamp, and corn. And, Sandhill Cranes! That's right, the legendary Jasper-Pulaski wildlife area up towards the northwest corner of the state produces an amazing congregation of cranes each fall, as they gather in large numbers before heading southward. Either they need to straighten their sign, or I have to learn to stand up straight. Some of my fab cam work may not be up to Ntional Geo standards, but it's good enough for this blog! The woodlands of Jasper-Pulaski were indisputably beautiful this late fall weekend. This small group of Bigtooth Aspen, Populus grandidentata, seemed almost luminescent in the sunlight, their lemony-yellow leaves aglow amongst the muted reds of the oaks. It isn't the foliage, or even the scenery so much that lures bird enthusiasts here. It is these - four foot tall, seven foot wing span, long-legged cranes. By the score. They are everywhere. Rarely, within the wildlife area, can you get out of earshot of the bugling rattles of the sandhills, and quite often groups are evident as they wing overhead. An estimated 10,000+ were present this weekend. This massive mowed field is ground zero for the cranes - and watchers - at J-P. The cranes come in and blanket this place at dusk, socializing, reinforcing relationships, talking, and even doing a bit of dancing. If you've not seen Sandhill Cranes dance, it is an amazing thing. As part of their courtship ritual, an individual will bow, fan its wings, and leap into the air while craning its neck about. A wee taste of what this field offers late in the day. All of those gray specks are cranes, but this was taken early in the day before the masses swarmed in. As nightfall sets, virtually all of the cranes in the J-P area are in this field, whooping it up. They only stay here for a relatively brief time; shortly after dusk flocks begin pouring back out of the field, headed towards a nearby marsh where they will actually spend the night. This field is all about socializing. I heard many a person that was there wonder why the cranes pick such a place to gather. A group of cranes coming in. You'll hear them long before you see them. The hauntingly melodic rattles of the birds can be heard for at least a mile, and it's a sound that has been heard here for millenia. We are just recent spectators in an age-old massing of the cranes in this former prairie region that was witnessed by the very first humans to come here. I suspect they were just as awed as I was. I didn't know much about Jasper-Pulaski prior to this expedition. Like everyone, I knew huge numbers of cranes came here, but not much else. After exploring nearly every road in the area, I understand the place much better, and know what brings the cranes here. Jasper-Pulaski is a former prairie, and a big one. It is loaded with relics of its prairie past, and is fascinating botanically. The cranes certainly have been coming to these prairie meadows for eons, both to nest and to gather in late fall. The above is a wet prairie meadow dominated by Northern Bluejoint, Calamagrostis stricta, a grass intimately associated with prairies. Birds, like these Sandhill Cranes, have their migratory maps embedded in their genes and as long as we don't completely destroy their habitat they will return to favored areas always. This is a gorgeous example of an oak savanna, maintained by fire. The sandy low hummocks between wetlands are carpeted with oak trees, mostly whites and blacks. This particular example is owned and managed by The Nature Conservancy, but there was plenty of other great-looking savanna habitat around. Red-headed Woodpeckers, acorn connoisseurs of the highest order, were everywhere. Chattering and chuckling amongst themselves, family units worked the oak fruit hard, busily stashing seeds for the winter. Between these beautiful savannas and the rich wetlands in the low-lying areas, J-P is an outstanding place and I hope to return in June to botanize sometime. One can only imagine what this region must have looked like prior to much of it being converted to the new prairie - corn, wheat and beans. As dusk draws near, it's time to return to the crane field and the observation platform. By now, cranes are streaming in from all directions, in groups of 5, 10, 30, 50 or more. Even the most jaded can't help but to be impressed by the spectacle. This eve, several hundred people came to watch the show. Like squadrons of avian bombers, the giant birds soar right over our heads, so close you can hear the wigeon-like whistles of the colts. For reasons we'll never understand, each group picks a spot within the packed field of acres of cranes, and comes in for a landing. Maybe they know the cranes nearby. It's hard to say, but they are undeniably social and the field becomes of a riot of crane chatter as everyone catches up with each other. Once darkness is nearly complete, flocks begin leaving the social field and heading north. They are making a short jaunt to this wetland complex a short distance off, where they will bed down for the night. By now, it is quite cold and just as the cranes leave in packs from the field, faster than they came in, so do the people. Dan Markham and Noel Hill of Duluth were setting up to hunt ducks on Lake Winnibigoshish near Deer River on Saturday when they noticed a dead bluebill on shore. A quick walk along the shore turned up another three dozen dead bluebills. Waterfowl biologists with the Minnesota Department of Natural Resources estimate that as many as 3,000 bluebills, also known as lesser scaup, may have died along the west shore of Lake Winnie. The die-off began Thursday, said Steve Cordts, DNR waterfowl specialist in Bemidji. Biologists believe the cause is a microscopic trematode, a kind of fluke, present in snails that the bluebills are feeding on. Cordts thinks the die-off could continue. “We’re going to find a lot more dead,” he said in a telephone interview Monday. Cordts and other DNR employees collected about 1,000 dead bluebills from a stretch of shoreline on Friday. In the time it took to collect about 900 of those birds, another 30 to 50 had died in the same stretch. The die-off also has affected coots, Cordts said, although most coots have already left Lake Winnie. He didn’t know how many bluebills remained on the lake. The snail that apparently is a host of the trematode is the banded mystery snail, Cordts said. It was first documented on Lake Winnie eight years ago by fisheries biologists. Die-offs of waterfowl due to trematodes have occurred in the spring and fall since about 2002 on the Mississippi River near Winona, Minn., Cordts said, though not in numbers as high as those on Lake Winnie. DNR officials sent a few ducks to the National Wildlife Health Center in Madison, Wis., on Thursday. An initial inspection turned up the trematode identification in one duck, but DNR officials were waiting Monday for confirmation of that in other samples. Hunters or others should not eat any duck that appears to be obviously diseased, Cordts said. Hunters should use latex gloves when cleaning their ducks. Cordts said he doesn’t know of any other major waterfowl die-offs due to trematodes other than those near Winona. Controlling the snail that serves as a host would be “almost impossible,” he said. Yes, it's that time of year. Late fall and cool temps are bringing the scaup streaming down from their northerly nesting grounds. As we speak, scaup - a kind of diving duck, for the unilluminati - are invading the midwest, coming to a water body near you. We have two species, you know. Lesser Scaup, Aythya affinis, which is the common Ohio scaup and under most conditions are default scaup. Then there is the larger Great Scaup, Aythya marila; a hardier beast that rides out the cold waters of Lake Erie winters as if it is nothing, feasting liberally on the Zebra and Quagga mussels. If you have any interest whatsoever in scaup, you'll want to log onto the amazing new "scaup-tracker". That's right, our friends the scaup now have their own website, developed and supported by our Canadian friends to the north. Good day, eh? Really, this site is quite interesting; nothing to "scaup" at, that's for sure. To tune in to the amazing "Scaup Tracker", visit this website, courtesy of Bird Studies Canada. Here, you can monitor the descent of these most interesting of ducks as they peregrinate cross-country and into our neck of the woods. Not only can you monitor large numbers of scaup as a whole, viewers can tune in to the madcap antics of their favorite scaup. Don't have a fav? You will, once you visit the website. You see, they've named their tagged birds, and fans can specifically select, say, "Ruby Rose", and learn that she was first picked up in extreme northeastern Canada on September 19, and by October 25 was down in New York state. "Howard" is a scaup with a mission. We pick up Ole Howie near Edmonton, Alberta on October 2, and learn that he pretty much straightlines it pronto to Lake Erie, arriving in our waters on October 23. So, have at it. Visit the site and scaup away. Spent the day down in the extreme southern reaches of the state, hard against the shores of the Ohio River. The trees were looking splendid; the forests were a riot of color. Very little else was, as the flowering plants have largely passed on and out for the season. Even the singing insects have greatly diminished, and with the cold nights fast approaching we'll not hear their serenades for much longer. The view from one of the most spectacular promontories overlooking the Ohio River Valley, near Portsmouth in Scioto County. Yon hills are good ole Kentuck; the Ohio River is smack against their base. Like the massive water body on our northern boundary, the valley of our mightiest river creates its own atmosphere. I took this as a brewing storm bluffed and blustered with spits of rain, while the sunshine poured through in the distance. Nothing much came of the threatening weather, and we remained dry. Did make for some spectacular skies, though. With the paucity of flowering plants - it is November! - I was excited to come across this last gasp of blooming chlorophyll. Stiff-leaved Aster, one of the most sensational in a sensational group of plants. Their bushy, near evergreen foliage capped with showy flowers makes this one worth a look. It's also rather the rarity, being confined to a handful of Ohio's southernmost counties. The nomenclature has gotten ugly, though. Many of us know these plants as "Aster", the formerly huge catch-all dumping ground for a big assemblage of plants that are generally easily recognized as asters. No more - they've been cut and dissected into pieces, and the new names are tongue-tyers compared to the former two-syllable moniker. This one you may have learned as Aster linariifolius. It is now Ionactis linariifolius. No complaints here. I feel that Aster was grossly oversimplified, and many of the groups, like this one, warrant generic level recognition. Besides, for many people it isn't that important what some propellerheads want to call it - the plant is still stunning by any name! Scores of tiny little owls are passing you by tonight. I bet everyone who reads this has passed within a half-mile of a Northern Saw-whet Owl within the last few weeks, if not closer. Yet few of our smallest eastern owl are detected, so adept are they at hiding during daylight hours. Northern Saw-whet Owls are irruptives; that is, they fluctuate from winter to winter in terms of the number of birds that move south. This is a boom year. All of the stations that are part of a banding network known as Project Owlnet are reporting capturing huge numbers. I've heard that some stations to our north have caught up to 1,200!!! so far this fall. 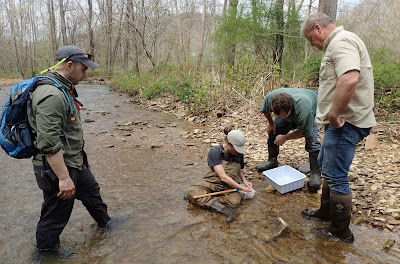 Kelly Sieg, Bill Bosstic, and Bob Placier operate a banding station near Chillicothe that focuses on saw-whet banding, and they've had their best year to date. They opened the nets in mid-October, and have already caught about 50 owls. They'll go to December 10 or so, so the total will soar well beyond the current figure. I would not be surprised if they eclipse 100 owls this season. They were good enough to allow myself and some friends to come down and join them last night, and by the time we left at 10:15, eight owls had been captured. As they typically run the nets until 1 or 2 am, I'm sure they caught more, but I've not yet heard the final tally. Following are some photos from this adventure. Some of our subjects. The owls are caught in mistnets strung through good habitat, then brought to a nearby building for processing. These two are hatch-year birds, and they display little to no fear of people. They'll occasionally snap their bills, but for the most part are as docile as can be. In fact, they seem to enjoy being stroked behind the head, and when pleasured in this way will often appear to virtually fall asleep. When we release them outside after keeping them in a dark room until their eyes re-acclimate to the dark, we'll sometimes set an owl on someone's arm or shoulder. It will often sit there for a minute or more, looking around and riding along with the person, before flying off into the black woods for points unknown. Aaron Boone, coordinator of the Ohio Breeding Bird Atlas, was along last night. Here Aaron processes an owl. This involves taking a number of measurements, gauging feather molt, body fat, coloration, and of course carefully placing a band on the owl's leg. The funnel to Aaron's left is part of the scale used to weigh birds. Most of these Northern Saw-whets tip in at a whopping 92 grams or so. The return rates of saw-whets are far higher than most groups of banded birds. A dozen or so of the owls caught in Chillicothe have been recaptured elsewhere, or they've caught other banded owls. A few nights before this, they captured an owl that had been banded at Whitefish Point, Michigan. 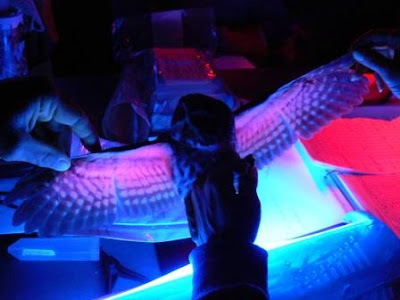 An interesting way of aging birds is to hold them under a black light. This causes certain feathers to glow pink, and with experience banders can use the reflected colors to see how old the individual is. It also creates a groovy atmosphere in the banding station. This is what a Northern Saw-whet Owl's ear looks like. They are sizeable apertures, and enable incredible powers of hearing. In many owl species, the ears are offset; they do not occur directly opposite of each other. This better allows the owl to triangulate on an object in very dark conditions, and pinpoint its location. If you are a mouse, this means big trouble. You'll probably never know what hit you. Keep your eyes peeled when around conifers, grapevine tangles, or dense shrubbery. We know that huge numbers of owls are moving through, but they are very easy to miss. But, you just might get lucky and spot one.